Well Tropical Storm Fay never reached hurricane status (top wind speeds were/are 60mph) but that hasn't kept people from taking precautions. It reminds me of the snow days we used to have when I was growing up in Northern Virginia, where school would be canceled the night before. Well here we are, the day of, and the only thing we've gotten so far is a little wind. Not even a lot of wind. It looks like the rain and strong wind are on their way. Of course I'm not complaining. I love tracking the hurricanes on the news as long as there is no major threat. Here is a water vapor images I got off the National Hurricane Center website from early this morning. 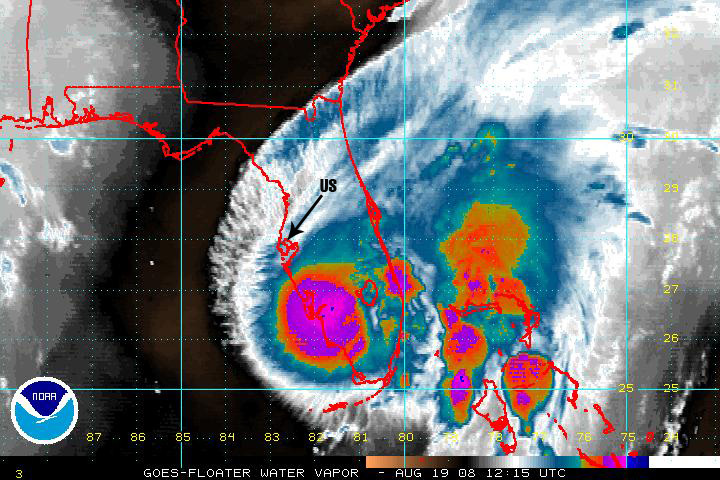 Fay made landfall a few hours south of the Tampa Bay Area. I love tropical storms and small hurricanes! always exciting! i was born during a hurricane! I thought of the exact same thing! I remember we had a week of school off once in NO VA and really after the 2nd day there was no reason. And all the early dismissals too...SO funny that you thought of that as well!! It always seemed like the group of us out in Western Loudoun was to blame because we were so much closer to the mountains. We had lots of ice and snow, and Eastern Loudoun barely had clouds, haha. It was always perfect to go hang out at the mall! Wow. Looks like it was fun trip. Loved the pictures.